soleymani, P., Sadjadi, S., gorji, M., taremi, F. (2018). Leader-follower competitive facility Location and Design problem in an uncertain environment. 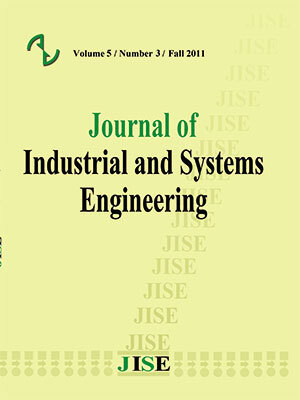 Journal of Industrial and Systems Engineering, 11(Special issue on game theory applications' in industrial engineering), 59-71.
parvin soleymani; Seyed Jafar Sadjadi; milad gorji; fatemeh taremi. "Leader-follower competitive facility Location and Design problem in an uncertain environment". Journal of Industrial and Systems Engineering, 11, Special issue on game theory applications' in industrial engineering, 2018, 59-71.
soleymani, P., Sadjadi, S., gorji, M., taremi, F. (2018). 'Leader-follower competitive facility Location and Design problem in an uncertain environment', Journal of Industrial and Systems Engineering, 11(Special issue on game theory applications' in industrial engineering), pp. 59-71.
soleymani, P., Sadjadi, S., gorji, M., taremi, F. Leader-follower competitive facility Location and Design problem in an uncertain environment. Journal of Industrial and Systems Engineering, 2018; 11(Special issue on game theory applications' in industrial engineering): 59-71. 1School of Industrial Engineering, Iran University of Science and Technology, Narmak, Tehran, Iran. This paper aims at providing a new approach to optimize location and design (quality) decision for new facilities as a leader-follower competitive configuration under the condition that competitor’s reaction is unknown. A chain is considered as a leader in the first level and tends to open a new facility in a specific market where similar competitor facilities as follower already exist. In the second level, the follower decides on locating and designing some facilities through the market subject to the location and design of leader’s facilities to keep or capture more market share. The market share captured by each facility depends on its distance to customers and its quality based on probabilistic Huff-like model. In facts, the leader decides on location and quality of its own new facility based on the follower reaction strategies to maximize its profit. Since the number of the follower’s new facilities are unknown for the leader, "robust optimization" is used for modeling this problem. A case from two chain stores in the city of Tehran, Iran, is studied and the proposed model is implemented. The computational results display the robustness and effectiveness of the model and highlight the importance of using robust optimization approach in uncertain competitive environments. Alekseeva, E., Kochetova, N., Kochetov, Y., & Plyasunov, A. (2010). Heuristic and exact methods for the discrete (r| p)-centroid problem. In Evolutionary Computation in Combinatorial Optimization (pp. 11-22). Springer Berlin Heidelberg. Drezner, T. (1998). Location of multiple retail facilities with limited budget constraints—in continuous space. Journal of Retailing and Consumer Services, 5(3), 173-184. Drezner, T. (2014). A review of competitive facility location in the plane. Logistics Research, 7(1), 1-12. Drezner, T., & Drezner, Z. (1998). Facility location in anticipation of future competition. Location Science, 6(1), 155-173. Drezner, Z. (1982). Competitive location strategies for two facilities. Fernández, J., Pelegrı, B., Plastria, F., & Tóth, B. (2007). Solving a Huff-like competitive location and design model for profit maximization in the plane. European Journal of Operational Research, 179(3), 1274-1287. Ghosh, A., & Craig, C. S. (1983). Formulating retail location strategy in a changing environment. The Journal of Marketing, 56-68. Gorji Ashttiani, M., Makui, A., & Ramezanian, R. (2011). Huff-type competitive facility location model with foresight in a discrete space. Management Science Letters, 1(1), 1-12. Gorji Ashttiani, M., Makui, A., & Ramezanian, R. (2013). A robust model for a leader-follower competitive facility location problem in a discrete space. Applied Mathematical Modelling, 37(1), 62-71. Huff, D. L. (1964). Defining and estimating a trading area. The Journal of Marketing, 34-38. Kononov, A. V., Kochetov, Y. A., & Plyasunov, A. V. (2009). Competitive facility location models. Computational Mathematics and Mathematical Physics, 49(6), 994-1009. Mulvey, J. M., & Ruszczyński, A. (1995). A new scenario decomposition method for large-scale stochastic optimization. Operations research, 43(3), 477-490. Nakanishi, M., & Cooper, L. G. (1974). Parameter estimation for a multiplicative competitive interaction model: least squares approach. Journal of Marketing Research, 303-311. Plastria, F. (2001). Static competitive facility location: an overview of optimization approaches. European Journal of Operational Research, 129(3), 461-470. Plastria, F., & Carrizosa, E. (2004). Optimal location and design of a competitive facility. Mathematical programming, 100(2), 247-265. Redondo, J. L., Fernández, J., García, I., & Ortigosa, P. M. (2010). Heuristics for the facility location and design (1| 1)-centroid problem on the plane. Computational Optimization and Applications, 45(1), 111-141. Saidani, N., Chu, F., & Chen, H. (2012). Competitive facility location and design with reactions of competitors already in the market. European journal of operational research, 219(1), 9-17. Santos-Peñate, D. R., Suárez-Vega, R., & Dorta-González, P. (2007). The leader-follower location model. Networks and Spatial Economics, 7(1), 45-61. Simpson, P. B. (1969). On defining areas of voter choice: Professor Tullock on stable voting. The Quarterly Journal of Economics, 478-490. Stackelberg, H. (1952). Marktform und Gleichgewicht, Vienna, Austria: Julius Springer, 1934. English translation: The Theory of the Market Economy. Rafael B, Emilio , Boglárka G, Amaya,2016. p -facility Hufflocation problem on networks, European Journal of Operational Research 255 (2016) 34–42.